We are proud to annouce that our innSIGHT Supervisor Web Server has been accepted as a finalist for the AIRAH Awards 2013 in the 'Excellence in Innovation' category. What are the AIRAH Awards? Celebrating outstanding achievements during the past year, the annual AIRAH Awards are the HVAC&R industry's most prestigious accolades. Awards will be presented on October 31 at a national awards presentation dinner at Moda Events Portside, Brisbane. "The AIRAH Awards are a pivotal component of the Institute’s activities," says AIRAH CEO Phil Wilkinson, M.AIRAH. "By acknowledging achievement among our membership, we raise the bar for the HVAC&R industry and beyond." innSIGHT is a true testament to "Australian Made" innovation. It is "Plug & Play" BMS web-server in a box, and a cost-effective solution for those who do not require a full BMS Server Computer, but want and need centralised control and monitoring of their system. innSIGHT incorporates a 5-user (dynamic) web-server, allowing centralised control and monitoring of all connected controllers through the clients intranet, or via the internet. Through the web-server, a client may view and adjust schedules, system variables, view alarms and email notifications, and view real-time and historic trends, and graphs directly from their own computers. Since its initial release, there have been various enhancements to the product, however none more impressive than the latest backward compatibility to support controllers up to 12 years old. This allows older controllers to have the latest in BMS technology, without the need to remove and upgrade the existing controllers that are still operational. Want to know more about the innSIGHT Supervisor Web Server? innSIGHT Product Spotlight for a complete overview. 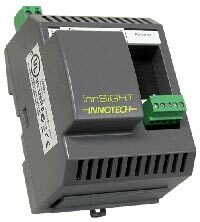 innSIGHT Product Details for a full list of features and tecnical specifications.